The first of two great compact discs full of the inventive and challenging solo piano stylings of Ran Blake. Long one of the prime movers of the Third Stream, Blake has been honored with a prestigious Mac Arthur Foundation Fellowship in recognition of his unique and profound artistry. 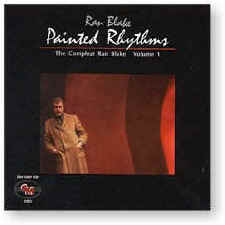 The two albums comprising Painted Rhythms: The Compleat Ran Blake follow Blake’s essential vision through his own compositions as well as interpretations of musics ranging from the jazz standards of Duke Ellington and Jerome Kern and of Scott Joplin rags of Volume 1 to the ancient Sephardic folk tunes and contemporary Spanish art songs that form the heart of Volume 2. 4. What’s Your Story, Morning Glory? Recorded (#1-13) in December 1985 at Houghton Chapel, Wellesley College, in Wellesley, Massachusetts, and (#14-15) at the North Shore Music Theatre in Beverly, Massachusetts.